AB Walls is a comprehensive design tool which outputs professional quality construction drawings with technical support data. It allows designers to transfer a conceptual layout from a site plan to a complete wall solution and then export it to various CAD software programs as well as to the 3D Modeling Program SketchUp. In addition, designers can generate elevations, plans, and multiple cross sectional views of their retaining wall projects. Inspired by the work on the Best Practices for SRW Design document to help drive the industry towards zero wall failures. What Else Can AB Walls 3D Design Software Do? A designer can model up to three different soil layers for both the infill and retained soil layers. 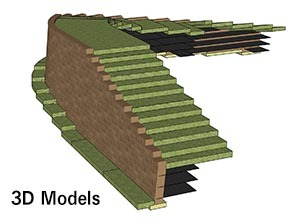 This multiple soil layer modeling is used in the Internal Compound Stability section of AB Walls. 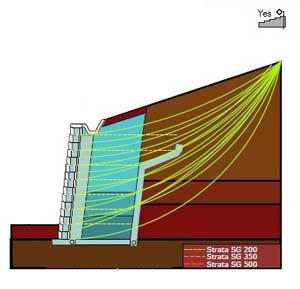 Use Trial Wedge Design Methodology for slopes above the wall in seismic regions. This provides the designer an alternative to the traditionally used Mononobe Okabe (M-O) method that greatly limits the steepness of slopes above any seismically loaded wall. 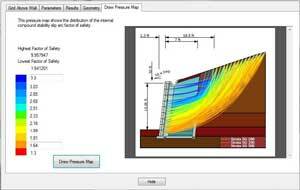 An engineer can see graphical results from the Internal Compound Stability analysis from the Pressure Mapping page. Offers Internal Compound Stability analysis to be applied to No-Fines Concrete designs. Recently completed independent testing has provided a conservative design friction angle which allows the designers to utilize the benefits of ICS calculations on No-Fines Concrete sections as well as geogrid applications. Provides complete design flexibility as each panel calculation is independent so the user can design with geogrid in one panel and No-Fines Concrete in the next panel, each having their own independent loading conditions. 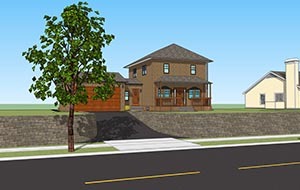 A designer can now create stunning three dimensional (3D) models of their designed AB retaining wall project to give them an advantage in the marketplace by offering a more complete design package. 3D model includes product and color options to give the customers a choice of looks and styles in the design process. Shows geogrid placement behind the wall, so a designer can review and catch potential problems in the design phase. Saves designers hours of time and offers a professional visualization of their designed project. Create models that they can share with Architects to be BIM (Building Information Model) compliant. Designers can choose from 33 typical details to be printed in both outputs. All design information in the Shop Drawing Output can be exported to .DXF format for use in any CAD program. Included are the Profile View, Plan View, Sections and Panel View, General Notes, Specifications and Specific Section Notes. 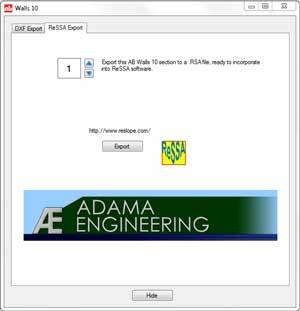 Allan Block has worked closely with the designers of ReSSA, the industry leading global stability analysis program, to allow the section information from AB Walls to be exported to a ReSSA file. This gives the wall designer the opportunity to easily transfer information from AB Walls to ReSSA to investigate the global stability of the project site quickly and efficiently. The Allan Block Engineering Dept. offers basic and advanced tutorials on the use of AB Walls. Tutorials are offered to individual engineers or can be done in a group setting to cover your firm’s engineers at once. These tutorials take less than 60 minutes to provide the designer with industry information and functionality of the program to begin designing retaining walls. Completed tutorials are then eligible for continuing education credits (CEU’s). 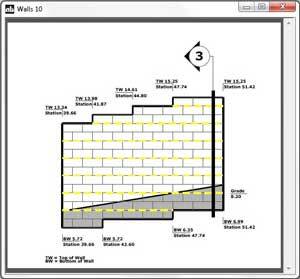 to get your copy of our AB Walls Design Software and schedule your tutorial. Please Note: Files created in AB Walls 10 or 2007 are not compatible with newer versions of AB Walls. 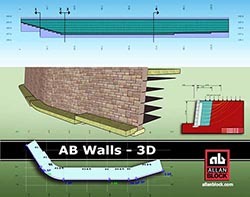 Allan Block Corporation no longer supports older versions of our AB Walls software. Contact your Local AB Representative to upgrade today or contact Allan Block Corp at (952) 835-5309 or engineering@allanblock.com.